12 days ago I pieced together the "Boxed In" blocks That Stash Bee had made for me last year. I liked them alot, and they were in a pattern and colors I'd chosen myself. But they'd languished in my stash for a full year, and though I'd put them on my Q2 Finish-A-Long list, I had done nothing with them since. So I was thinking of them as the end of the quarter was drawing near, and it dawned on me they'd be a great backing for my in-progress Scrap Vortex quilt. So with that plan, and the bee's blessing, I made it so. Fast forward to last week when Adrianne/On the Windy Side posted the link-up for the quarter. My Scrap Vortex was still up on the design wall in pieces, and I had pretty much resigned myself that the Scrap Vortex/Boxed In combo wouldn't be completed in time to link up. The weather in the Seattle area was reaching record highs, and just the thought of sewing was kind of nauseating. Except the next night, by some marvel, I was inspired to see if I could make it. I rounded up another fan for the studio, and got busy. I confess I thought Amanda/crazy mom quilts' idea of quilting a spiral was a terrific one, and I actually started one but not happy with my workmanship, I took it out and went with my original thought, a vertical serpentine. I kinda like it. With this kind of quilting, I usually mark my quilt with a hera marker every 3 1/2" or so. Then I sew down those lines with my walking foot clear across the quilt, starting in the center and then moving out to each edge. That way, everything is stabilized and from there, no more marking is needed. I eye it as I quilt down the center between my marked lines, and continue in that way, depending how dense I want the quilting to be. This time I went pretty dense, and I have no doubt that once it's washed, the texture will be amazing. Thread was my default Auriful 50wt #2021 (natural white), which shows up clearly on the solid and tone-on-tone fabrics, and not so much on the busy prints. I think that contrast just adds an element of interest to the quilt. For binding, I couldn't help but go with the black and white Michael Miller Clown Stripe - just love it on a scrappy quilt. The #scrappyvortexqal was alot of fun. When I started, I foolishly thought I'd make a real dent in my scraps, but I have oodles left. And yes, I could have gone bigger with my quilt, but I was ready to be done, and once I thought of using the Boxed In blocks for the back, I knew 48" x 60" was all I needed. So there ya go. I'm super pleased with how my bilateral quilt turned out. I've thought of doing a 2-sided quilt before, but I think this is the closest I've gotten. Kinda fun. Linking up with 2015 Finish Along - Q2 Finishes and Scraptastic Tuesday. This is amazing Debbie! It really is a 2 sided quilt - I do love the serpentine quilting and the striped binding is perfect. Great finish! It truly is a two sided (bilateral!) quilt! Love the striped binding too! It's lovely Debbie. I like the Scrap Vortex; I must look those instructions up on the net. 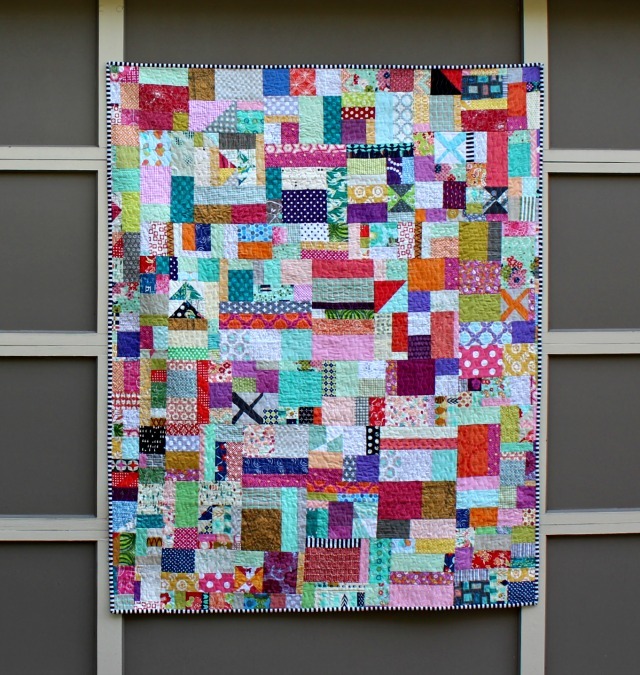 Your bee blocks are great, in fact, too good to be just a backing, so you can really use this quilt both ways as the mood takes you! Love the Boxed In blocks side. Such a super fun quilt Debbie. 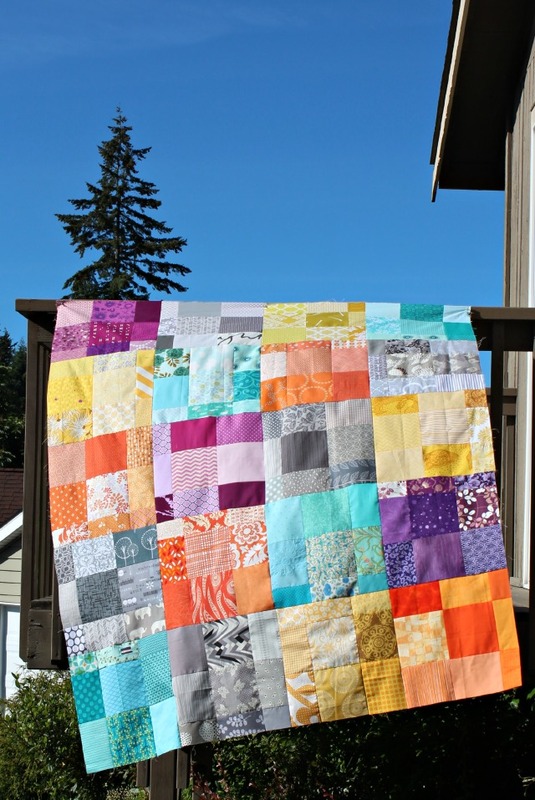 Love the two sides and your quilting. It's perfect for this quilt. What fun! 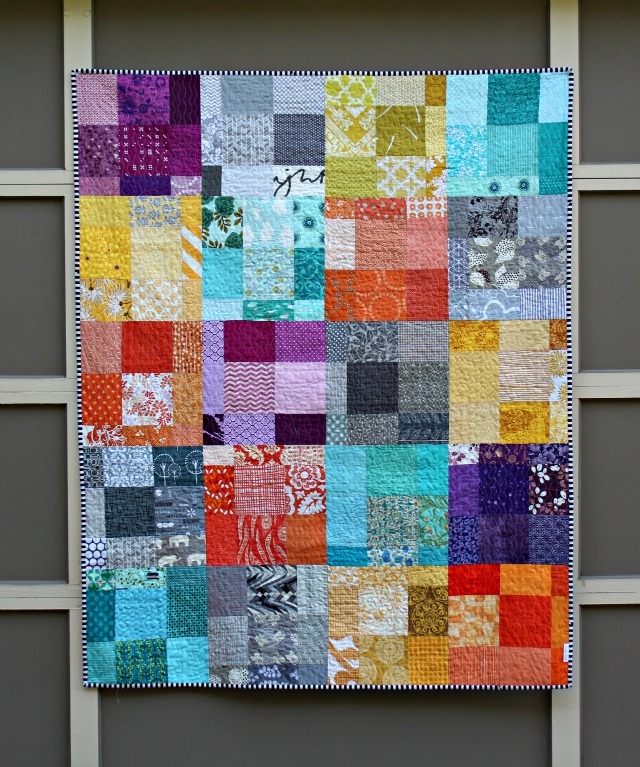 It is such a colourful quilt and the quilting is a great compliment to all that colour and pattern. They play perfectly together. Congrats on a successful push to the finish line. Some of my favorite projects have been created under time pressure when you're "all in" and the juices are flowing. Hope the weather cools. Fabulous on all levels! Love it!!!!! it looks great and completely reversible! Both sides look fabulous. I finished my scrap vortex last night but haven't had a chance to photograph it yet. Great finish! It is so happy and colorful! My scrap bins look the same after making a giant scrap vortex. Funny how that is. 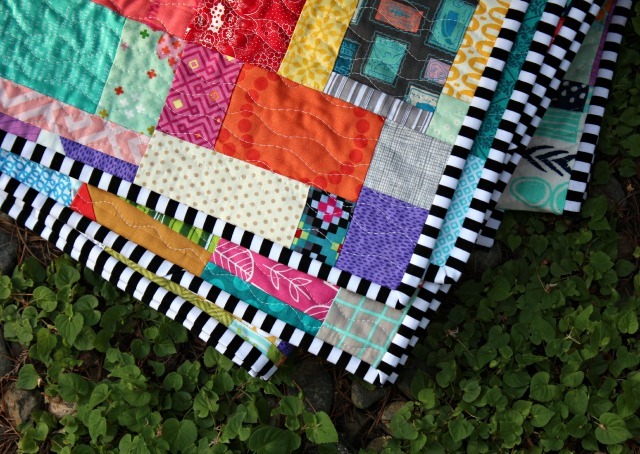 Thanks for the info on how you did the serpentine quilting - it looks great and I've been wanting to try it! You finish is awesome. I, too, did the scrapvortexqal and made two NICU quilts. 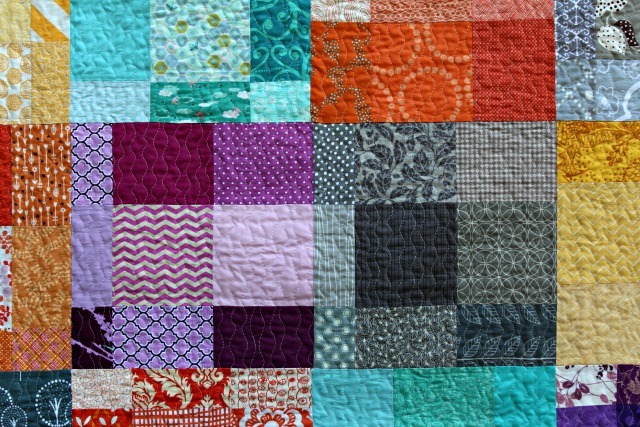 I think next time I'll follow My Quilt Infatuation's lead and made 12.5" blocks (sew a bunch together and cut blocks then piece the cut-offs) because my brain works better that way than trying to piece things together of different sizes. Anyway, it is a great way to use up scraps and I, too, have plenty more. So cute and colorful! I love it!! Oh how I love using the b/w stripe for binding...........doesn't it make everything just shine?! Awesome! Either side would be a spectacular quilt...but together! Wowser! And the quilting is great! 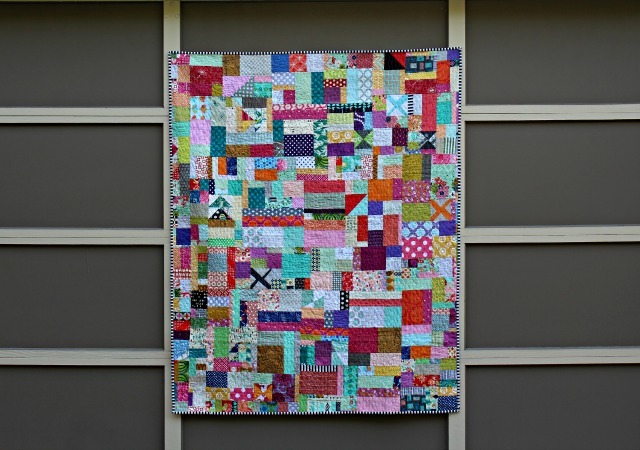 What an amazing scrappy two-sided quilt. Love it!